Julia Buntaine, founder of the SciArt Magazine and SciArt Center, studied neuroscience and sculpture at Hampshire College, received a post-baccalaureate certificate in Studio Art from Maryland Institute College of Art and an MFA of Fine Arts from the School of Visual Arts. 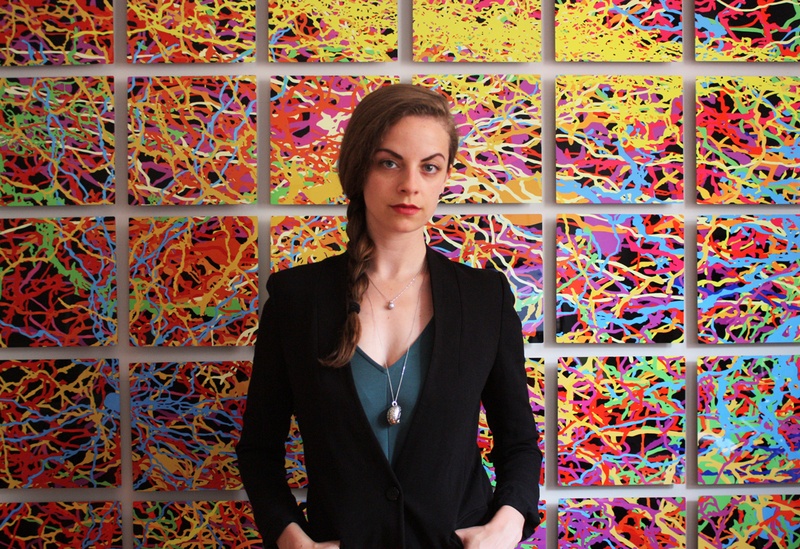 Buntaine combines her fascination with neuroscience and art by creating visual works about the brain in a range of media – from digital paintings to sculptures to installations. She established the SciArt Center and publication to provide a platform to facilitate cross-disciplinary dialogues between scientists, artists and scientist-artists. IAM LAB: How did you become involved in both art and neuroscience? Buntaine: While I’ve always been an artist (I went to an arts high school, and was the kind of teenager who took doodling very seriously), I happened upon neuroscience in college when I was trying out different types of classes as a first-year student. Psychology and mental illness were subjects I was very interested in, but it was in neuroscience that I found the hard science behind the mental life, and there was something comforting and fascinating to me in the tangibility of biology that I took to immediately. In retrospect it’s not that surprising – I’m a sculptor by disposition, so I generally like tangible things. I studied neuroscience and sculpture side-by-side in college, running from the lab to the studio and back. While I was in neuroscience class, I learned how materials of the body are put together to create larger structures like neurons. While I was in sculpture class, I learned how materials of the world are put together to create larger structures like statues. So, biology and art always felt very much the same to me, and by my third year the brain became my artistic muse and I began to make work about the brain exclusively. My creating art about the brain started with a fascination in the structure of and beauty of biology. IAM Lab: How have you been able to combine these fields when you began your training, and how has that intersectionality evolved as you advanced your training? Buntaine: Through making art about neuroscience I started to understand biology in a visual and bodily manner – by creating a 12-foot-long sculpture of a neuron, I could feel the physicality of something which is normally too small to see with the naked eye. Visual and bodily knowledge is something I’m very interested in as an artist because it’s a different, intuitive way to engage with and understand science for my audience. These thoughts on making art about science, and how to share science through art, all started to percolate in me while I was in my third year of college. During my fourth year I came to the decision point of pursuing art rather than science professionally, so my thesis culminated in the neuroscience-based art exhibit “NeuroSculpture.” The decision was easy once I realized (after many sleepless nights) that while neuroscience was what I loved to think about, art was what I loved to do. By making art about the brain, I didn’t have to give up either and instead combined my interests in the way that made sense to me. I think I will always make art about the brain. In addition to finding it a fascinating subject matter, I believe it’s genuinely important, and I’m very passionate about bringing neuroscience to the public through my visual means. I look for facts, figures or mechanisms of the brain which lend themselves to a visual translation and find the best medium to create my piece in from there. The science of the brain is a universal subject matter – we all have one, after all. Sharing the wonder of biology we have found in ourselves is my ultimate aim as an artist. IAM Lab: How has your training in both the arts and neuroscience influenced your interests and career goals? What are the most useful tools of having a cross-disciplinary background or partnership? While I was a student it was painfully clear to me that the separation between the arts and sciences was ever-present and based on outmoded ideas and prejudices. I had my art friends and my science friends, but they didn’t know each other despite how much they had in common. Outside of academia you see the same thing – people naturally run in social circles with those with whom they share a common profession. In our ever-specialized world, it’s actually quite difficult to get out and meet people who do something totally different than you, despite the fact that you may actually be doing similar work. For example, Einstein and Picasso were contemporaries, both thinking about the relationship between space and time. Einstein’s thoughts on space/time culminated in his special theory of relativity, while Picasso’s took form in the invention of the art style Cubism. They never knew one another, but they read the same mathematical texts, and I love to think about how amazing a conversation between them would have been. Since I was jumping across disciplines as a student, I concluded early on that there’s no reason why disciplinary boundaries should separate like-minded people. My engagement with the cross-disciplinary science-art world quickly grew beyond my own art practice to starting a publication (SciArt Magazine) and then a center (SciArt Center). I had some experience in the publishing world from being an editor on my college’s newspaper and from a few post-college internships, and that was enough to get me started on the magazine. The Center part of SciArt came a bit later as a natural evolution and expansion. Artists and scientists both investigate our fundamental questions: Who are we? Why are we here? Where do we come from? Where are we going? No matter the discipline, artists and scientists should be aware of each other’s work to be informed and inspired, to spark critical dialogue or to collaborate. Bringing together the arts and sciences in our culture at large through our publication, events and residency program is the mission on which SciArt was founded.